This year will be celebrated at Christ the King. Mass of the Lord’s Supper will be at 7.00 pm on Holy Thursday. The Commemoration of Our Lord’s Passion and Death at 3.00 pm on Good Friday. The Easter Vigil will begin at 7.00 pm [sunset being 6.37pm]. Clocks go forward one hour during the Easter Weekend. Mass on Easter Sunday will be at the usual times of 9.00 am and 11.00 am. The Walk of Witness from Our Lady & St Joseph’s Church to the Wayside Shrine at Wetheral Plains Road begins at 5.00 pm and lasts about an hour. Transport is available throughout the walk. On Good Friday morning at St. Margaret Mary at 11.00 am. The choir will be resuming on Sunday evenings from 7.00 pm to 8.30 pm, starting from Sunday 7th February. All are welcome to join us, especially new members. We will be preparing music for the Easter liturgies and just enjoying being together and singing. We are now once again collecting for food parcels for local families to be distributed during the week beginning Monday 14th March. Please check labels for 'best before' dates. Thank you in advance for your continued generosity. Mass attendance last weekend was 63 + 81 + 101= 245 and the collection was £485.88 + £308.92 = £794.80. Thank you for your generosity. Hosted by the Cor et Lumen Christi community, Wigton, Saturday 19 March from 8.15 pm at St Augustine’s. All are welcome. For more information, phone 016973-45623 or 07516-075896, visit: www.coretlumenchristi.org, e-mail stcuthberts@coretlumenchristi.org. 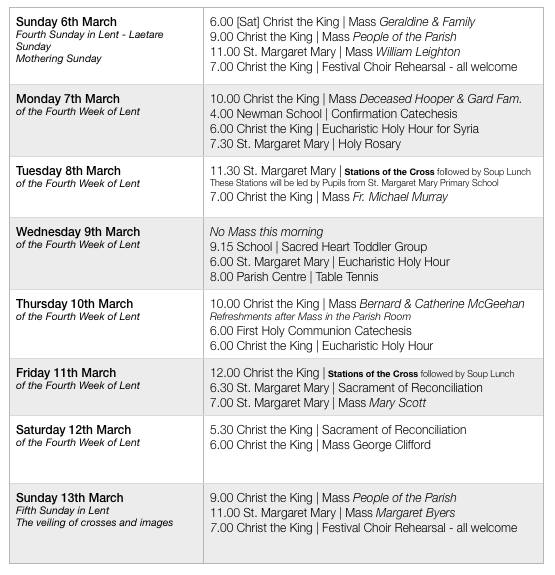 A Spring conference for the North, hosted by the Cor et Lumen Christi community, Wigton CA7 9HU, 18-20 March, with Damian Stayne. Healing miracles, inspiring teaching, powerful prayer ministry, joyful praise and intimate worship, eucharistic adoration, Mass. Donation only. To book or for more information, visit: www.coretlumenchristi.org, e-mail stcuthberts@coretlumenchristi.org or phone 016973-45623 / 07516-075896. A coach will travel from Carlisle for all who wish to attend the Chrism Mass at Lancaster cathedral, Holy Thursday, 24 March. It will leave OL&SJ at 9.30 am and return at 3.00 pm. This is also an opportunity to pass through the Jubilee Door of Mercy at the cathedral. Cost £10 per person. Please contact OL&SJ or sign the sheet at the back of OL&SJ church. Lists will be placed at the back of both churches this weekend. This is taking place at The New Waterton Hall on Saturday 9th April from 12.45 pm. Proceeds from this event will be channelled through the SVP Twinnage Scheme. If you have anything you could possibly donate to this auction, please contact Greg Smith at church or tel: 562756. Collection can be arranged. This event is being organised by the Extended Family of The Sacred Heart of Mary. Sr Gerald & Sr Maureen invite you to join them each week to pray for a change of heart for the people of violence in Syria and for their victims. Mondays, 6.00 pm - 7.00 pm. Envelopes for the next financial year will be available shortly for those parishioners who are members of the scheme. Standing order donors do not need to take any further action unless they wish to increase their contribution. If a parishioner, who is a tax payer, would like to join the scheme, please contact Paul on 51138 for CTK or Richard on 544737. If you have ceased paying tax and are part of the scheme, please notify the organisers. Please consider giving via the Gift Aid scheme - it increases your donation without any additional cost to yourself. Fr. Michael will be away following a baptism on Saturday 2nd April until Friday 15th April. Fr. Norman will be covering the weekend Masses. The collection on Good Friday supports Christians in the Holy Land and the upkeep of shrines associated with the earthly life of our Blessed Lord. The collection at Easter contributes to Fr. Michael’s annual allowance. Be aware that priests are not supported from a central fund but solely through the generosity of individual parishioners in a parish. The diocese is hosting a discernment day for those thinking about priesthood on Saturday 9 April, 10.30 am - 4.00 pm at Ladyewell Shrine, Preston. Transport can be provided from Preston Station. Join others who are thinking about priesthood. To book a place or for more information, please contact Fr Darren Carden on 01772-719604 / 07552-795060 or email: priest@lancastervocations.org. Thank you to all who attended this period of adoration. An evening of entertainment at St. Margaret Mary’s Parish Centre on Friday 12th March from 7.30 pm with Rocking Rev Fr. Kevan Dorgan. Tickets available from behind the bar or from Paul Lovell. 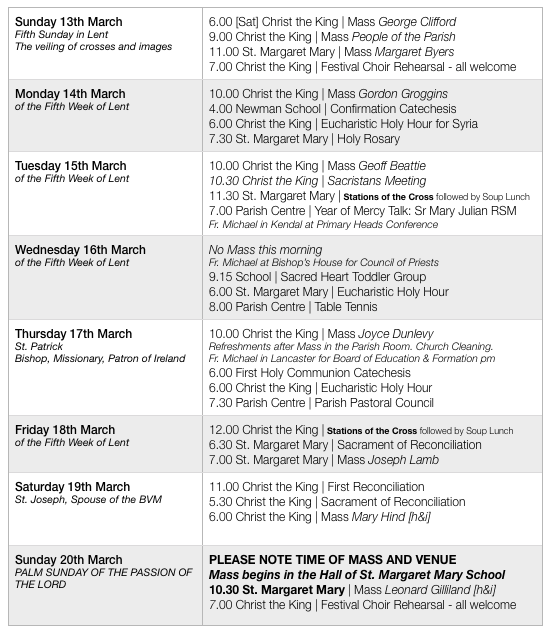 Holy Week begins with Palm Sunday - this year there will be a vigil Mass at Christ the King at 6.00 pm as usual but on Palm Sunday morning there will be only one celebration of Mass at 10.30 am at St. Margaret Mary. Please make a note of this. This year will be celebrated at Christ the King. Mass of the Lord’s Supper will be at 7.00 pm on Holy Thursday. The Commemoration of Our Lord’s Passion and Death at 3.00 pm on Good Friday. The Easter Vigil will begin at 7.00 pm [sunset being 6.37pm]. Clocks go forward one hour during the Easter Weekend. 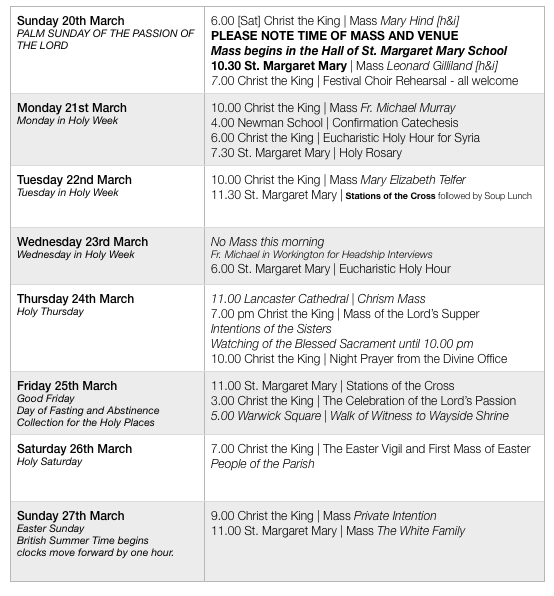 Mass on Easter Sunday will be the usual times 9.00 am and 11.00 am. On Tuesday at 11.30 am at St. Margaret Mary and on Friday at 12.00 noon at Christ the King. Followed by a soup lunch - donations to Mary’s Meals. This week the Stations at St. Margaret Mary will be led by pupils from our parish school. The choir will be resuming on Sunday evenings from 7.00 to 8.30 pm, starting from Sunday 7th February. All are welcome to join us, especially new members. We will be preparing music for the Easter liturgies and just enjoying being together and singing. Places have become available on the parish pilgrimage to Rome this May. For more information, contact Gill at Tangney Tours on 01732 886666. Mass attendance last weekend was 68 + 71 + 107= 246 and the collection was £406.55 + £280.57 = £687.12. Thank you. The play by T. S. Eliot will be performed by Classic Theatre Cumbria, Thursday 10 – Saturday 12 March, Carlisle cathedral. In aid of the Mayor’s Charity. Details and tickets from info@classictheatrecumbria.co.uk, or 07970-673236. Hosted by the Cor et Lumen Christi community, Wigton, Saturday 19 March from 8.15pm at St Augustine’s. All are welcome. For more information, phone 016973-45623 or 07516-075896, visit: www.coretlumenchristi.org, e-mail stcuthberts@coretlumenchristi.org. A Spring conference for the North, hosted by the Cor et Lumen Christi community, Wigton CA7 9HU, 18-20 March, with Damian Stayne. Healing miracles, inspiring teaching, powerful prayer ministry, joyful praise and intimate worship, eucharistic adoration, Mass. Donation only. To book or for more information, visit: www.coretlumenchristi.org, e-mail stcuthberts@coretlumenchristi.org, or phone 016973-45623 / 07516-075896. Tuesday 15 March, at 7.00 pm, St Margaret Mary’s Parish Centre, Scalegate Road CA2 4JX: Blessed are those who mourn. A coach will travel from Carlisle for all who wish to attend the Chrism Mass at Lancaster cathedral, Holy Thursday, 24 March. It will leave OL&SJ, 9.30 am and return at 3.00 pm. This is also an opportunity to pass through the Jubilee Door of Mercy at the cathedral. Cost £10 per person. Please contact OL&SJ, or sign the sheet at the back of OL&SJ church. Fairtrade Fortnight, 29 February - 13 March highlights the principles of Fairtrade and the wide range of products available. You are invited to join the Fairtrade Big Breakfast and Coffee Morning, Saturday 12 March, 9.00 am-12 noon, the Border Kirk, Chapel Street, with a visiting Colombian coffee producer. £2 per person. For the Holy Year of Mercy, the diocese is offering a day of recollection to support & en- courage members of Parish Pastoral Councils on Saturday 12 March from 11.00 am to 4.00 pm, OL&SJ, Warwick Square. Please book your place by e-mailing sistermaryjulian@gmail.com. Tea & coffee will be provided. Please take a packed lunch.